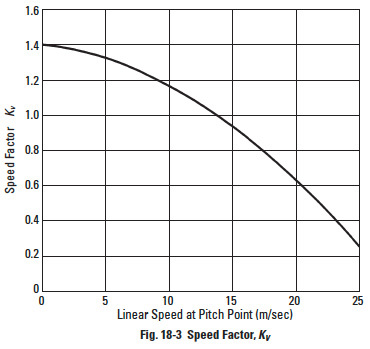 The sliding speed factor is obtainable from Figure 17-14, where the abscissa is the pitch line linear velocity. 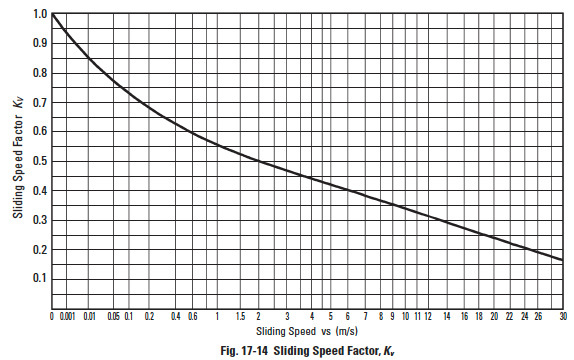 The rotating speed factor is presented in Figure 17-15 as a function of the worm gear's rotating speed, n2. Let ZL = 1.0 if the lubricant is of proper viscosity and has antiscoring additives. Some bearings in worm gear boxes may need a low viscosity lubricant. Then ZL is to be less than 1.0. 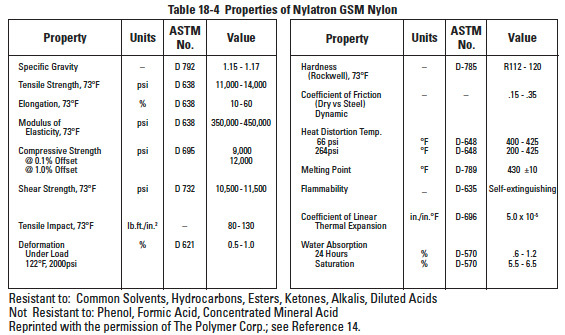 The recommended kinetic viscosity of lubricant is given in Table 17-29. The lubrication factor, ZM, is obtained from Table 17-30. This factor is concerned with resistance to pitting of the working surfaces of the teeth. Since there is insufficient knowledge about this phenomenon, the factor is assumed to be 1.0. 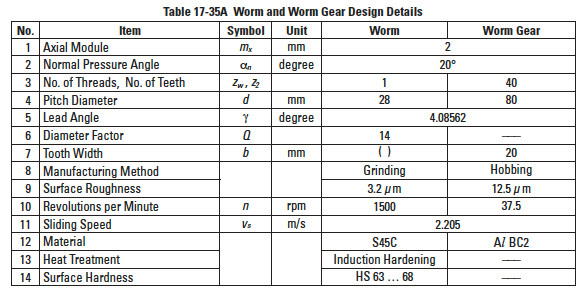 It should be noted that for Equation (17-58) to be applicable, surfaces roughness of the worm and worm gear must be less than 3 µm and 12 µm respectively. If either is rougher, the factor is to be adjusted to a smaller value. Quality of tooth contact will affect load capacity dramatically. Generally, it is difficult to define precisely, but JIS B 1741 offers guidelines depending on the class of tooth contact. 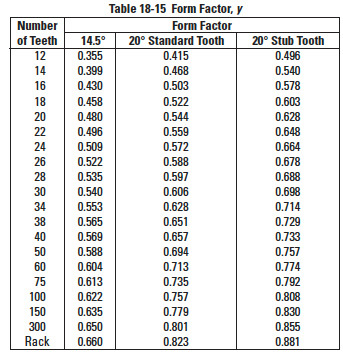 Table 17-31 gives the general values of Kc depending on the JIS tooth contact class. This factor depends upon the magnitude of starting torque and the frequency of starts. 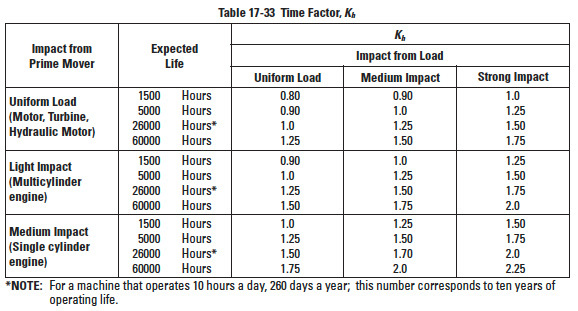 When starting torque is less than 200% of rated torque, Ks factor is per Table 17-32. This factor is a function of the desired life and the impact environment. See Table 17-33. The expected lives in between the numbers shown in Table 17-33 can be interpolated. 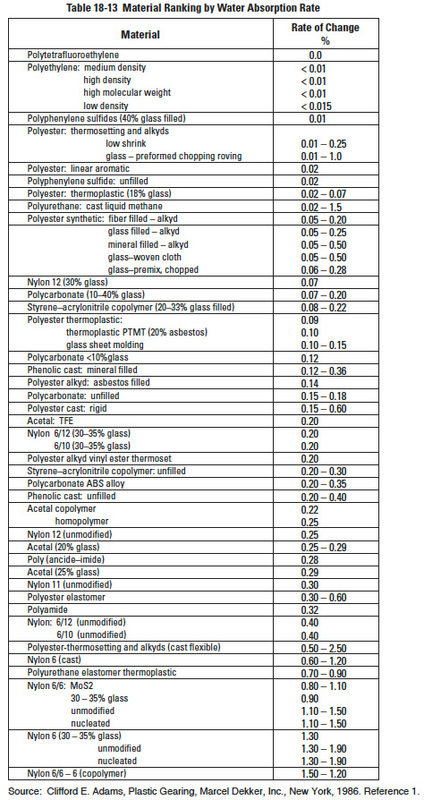 Table 17-34 presents the allowable stress factors for various material combinations. Note that the table also specifies governing limits of sliding speed, which must be adhered to if scoring is to be avoided. 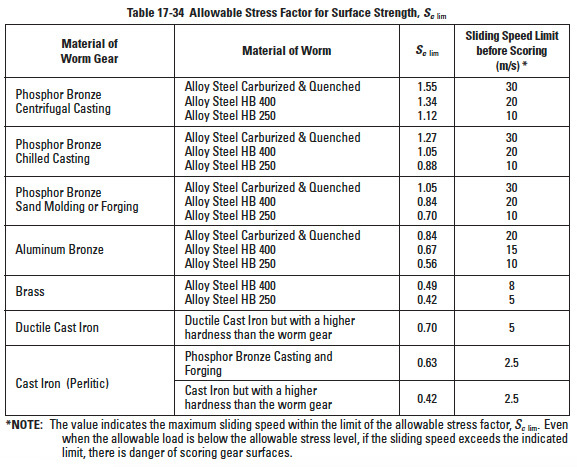 See Table 17-35A and 17-35B for examples of worm mesh strength calculation. Plastic gears are continuing to displace metal gears in a widening arena of applications. Their unique characteristics are also being enhanced with new developments, both in materials and processing. In this regard, plastics contrast somewhat dramatically with metals, in that the latter materials and processes are essentially fully developed and, therefore, are in a relatively static state of development. Plastic gears can be produced by hobbing or shaping, similarly to metal gears or alternatively by molding. The molding process lends itself to considerably more economical means of production; therefore, a more in-depth treatment of this process will be presented in this section. Elimination of machining operations; capability of fabrication with inserts and integral designs. One step production; no preliminary or secondary operations. 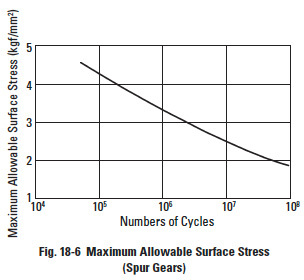 Less load-carrying capacity, due to lower maximum allowable stress; the greater compliance of plastic gears may also produce stress concentrations. Plastic gears cannot generally be molded to the same accuracy as highprecision machined metal gears. Plastic gears are subject to greater dimensional instabilities, due to their larger coefficient of thermal expansion and moisture absorption. Reduced ability to operate at elevated temperatures; as an approximate figure, operation is limited to less than 120°C. Also, limited cold temperature operations. Initial high mold cost in developing correct tooth form and dimensions. Can be negatively affected by certain chemicals and even some lubricants. Improper molding tools and process can produce residual internal stresses at the tooth roots, resulting in over stressing and/or distortion with aging. Costs of plastics track petrochemical pricing, and thus are more volatile and subject to increases in comparison to metals. 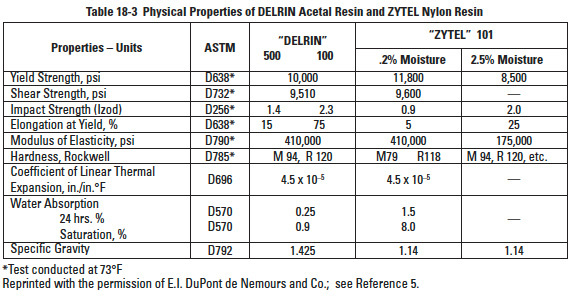 Popular materials for plastic gears are acetal resins such as DELRIN*, Duracon M90; nylon resins such as ZYTEL*, NYLATRON**, MC901 and acetal copolymers such as CELCON***. The physical and mechanical properties of these materials vary with regard to strength, rigidity, dimensional stability, lubrication requirements, moisture absorption, etc. Standardized tabular data is available from various manufacturers' catalogs. Manufacturers in the U.S.A. provide this information in units customarily used in the U.S.A. In general, the data is less simplified and fixed than for the metals. This is because plastics are subject to wider formulation variations and are often regarded as proprietary compounds and mixtures. 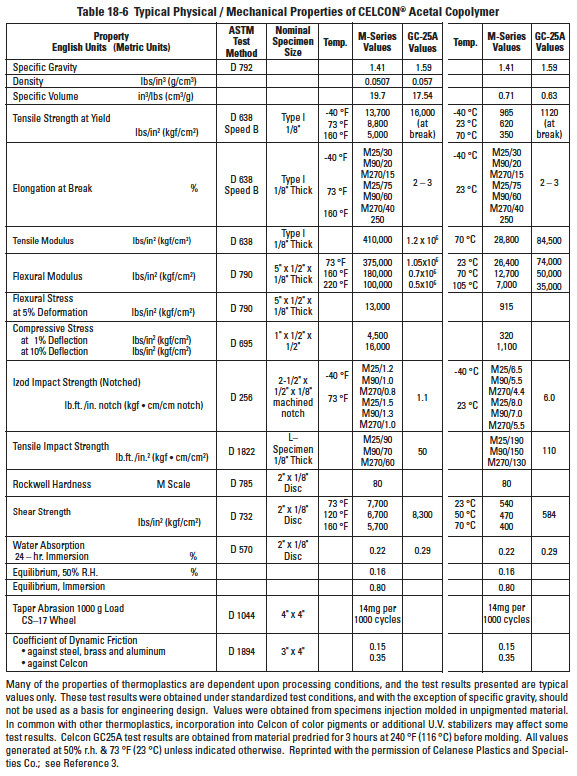 Tables 18-1, 18-2, 18-3, 18-4, 18-5, 18-6, 18-7, 18-8 and 18-9 are representative listings of physical and mechanical properties of gear plastics taken from a variety of sources. 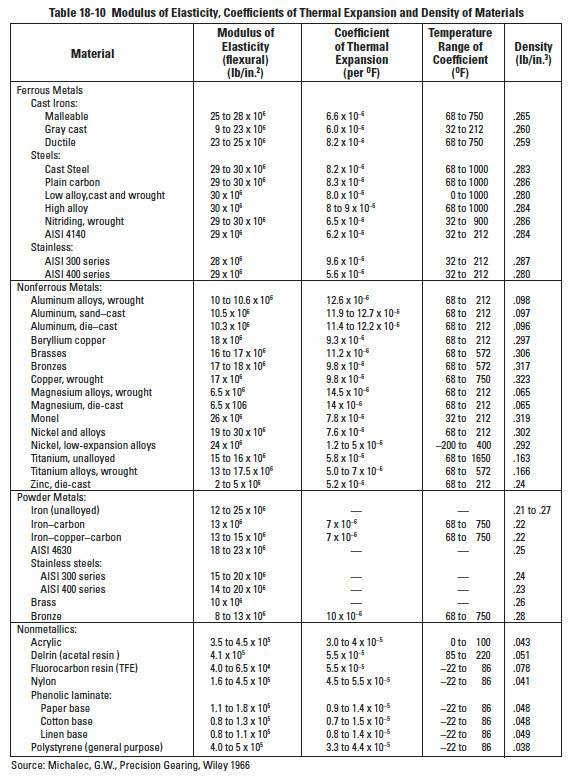 All reprinted tables are in their original units of measure. It is common practice to use plastics in combination with different metals and materials other than plastics. Such is the case when gears have metal hubs, inserts, rims, spokes, etc. In these cases, one must be cognizant of the fact that plastics have an order of magnitude different coefficients of thermal expansion as well as density and modulus of elasticity. For this reason, Table 18-10 is presented. Other properties and features that enter into consideration for gearing are given in Table 18-11 (Wear) and Table 18-12 (Poisson's Ratio). 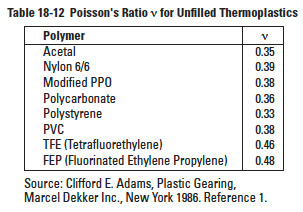 Moisture has a significant impact on plastic properties as can be seen in Tables 18-1 thru 18-5. 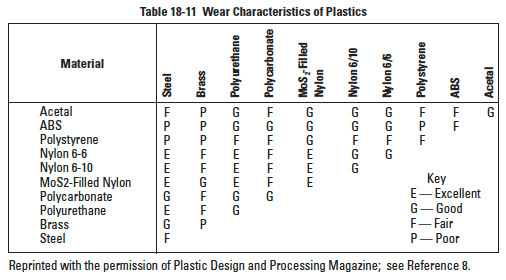 Ranking of plastics is given in Table 18-13. In this table, rate refers to expansion from dry to full moist condition. Thus, a 0.20% rating means a dimensional increase of 0.002 mm/mm. Note that this is only a rough guide, as exact values depend upon factors of composition and processing, both the raw material and gear molding. For example, it can be seen that the various types and grades of nylon can range from 0.07% to 2.0%. 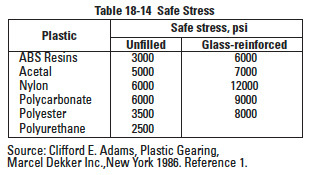 Table 18-14 lists safe stress values for a few basic plastics and the effect of glass fiber reinforcement. It is important to stress the resistance to chemical corrosion of some plastic materials. These properties of some of materials used in the products presented in this catalog are further explored. - For many nonorganic acids, even at low concentration at normal temperature, it should not be used without further tests. - For nonorganic alkali at room temperature, it can be used to a certain level of concentration. - For the solutions of nonorganic salts, we may apply them to a fairly high level of temperature and concentration. - MC901 has better antiacid ability and stability in organic acids than in nonorganic acids, except for formic acid. - MC901 is stable at room temperature in organic compounds of ester series and ketone series. - It is also stable in mineral oil, vegetable oil and animal oil, at room temperature. - Good resistance against nonorganic chemicals, but will be corroded by strong acids such as nitric, sulfuric and chloric acids. - Household chemicals, such as synthetic detergents, have almost no effect on M90. - M90 does not deteriorate even under long term operation in high temperature lubricating oil, except for some additives in high grade lubricants. - With grease, M90 behaves the same as with oil lubricants. Gear designers interested in using this material should be aware of properties regarding individual chemicals. Plastic manufacturers' technical information manuals should be consulted prior to making gear design decisions. Pressure angles of 14.5°, 20° and 25° are used in plastic gears. The 20° pressure angle is usually preferred due to its stronger tooth shape and reduced undercutting compared to the 14.5° pressure angle system. The 25° pressure angle has the highest load-carrying ability, but is more sensitive to center distance variation and hence runs less quietly. The choice is dependent on the application. The determination of the appropriate module or diametral pitch is a compromise between a number of different design requirements. A larger module is associated with larger and stronger teeth. For a given pitch diameter, however, this also means a smaller number of teeth with a correspondingly greater likelihood of undercut at very low number of teeth. Larger teeth are generally associated with more sliding than smaller teeth. On the other hand, smaller modules, which are associated with smaller teeth, tend to provide greater load sharing due to the compliance of plastic gears. However, a limiting condition would eventually be reached when mechanical interference occurs as a result of too much compliance. Smaller teeth are also more sensitive to tooth errors and may be more highly stressed. A good procedure is probably to size the pinion first, since it is the more highly loaded member. It should be proportioned to support the required loads, but should not be over designed. In the following text, main consideration will be given to Nylon MC901 and Duracon M90. However, the basic equations used are applicable to all other plastic materials if the appropriate values for the factors are applied. The allowable tangential force F (kgf) at the pitch circle of a Nylon MC901 spur gear can be obtained from the Lewis formula. Duracon M90 The allowable tangential force F (kgf) at pitch circle of a Duracon M90 spur gear can also be obtained from the Lewis formula. 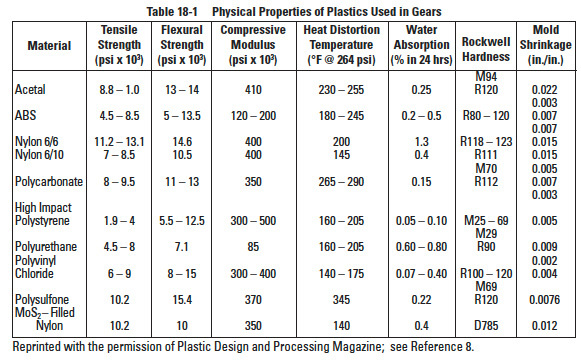 Plastic gears have larger coefficients of thermal expansion. Also, they have an affinity to absorb moisture and swell. Good design requires allowance for a greater amount of backlash than for metal gears. Most plastic gears do not require lubrication. 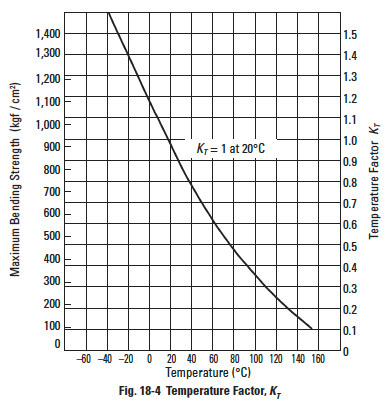 However, temperature rise due to meshing may be controlled by the cooling effect of a lubricant as well as by reduction of friction. Often, in the case of high-speed rotational speeds, lubrication is critical. If one of the gears of a mated pair is metal, there will be a heat sink that combats a high temperature rise. The effectiveness depends upon the particular metal, amount of metal mass, and rotational speed. Duracon gears have less friction and wear when in an oil lubrication condition. However, the calculation of strength must take into consideration a no-lubrication condition. The surface strength using Hertz contact stress, Sc, is calculated by Equation (18-4). If the value of Hertz contact stress, Sc, is calculated by Equation (18-4) and the value falls below the curve of Figure 18-6, then it is directly applicable as a safe design. 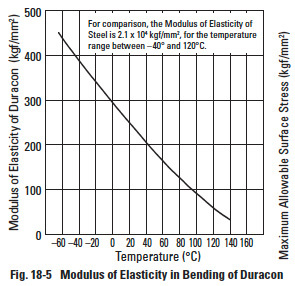 If the calculated value falls above the curve, the Duracon gear is unsafe. Figure 18-6 is based upon data for a pair of Duracon gears: m = 2, v = 12 m/s, and operating at room temperature. For working conditions that are similar or better, the values in the figure can be used. The allowable tangential force at the pitch circle is calculated by Equation (18-5). y = Form factor at pitch point, which is obtained from Table 18-15 by computing the number of teeth of equivalent spur gear via Equation (18-6). Other variables may be calculated the same way as for spur gears. The allowable tangential force F (kgf) on pitch circle of Duracon M90 bevel gears can be obtained from Equation (18-7). and y = Form factor at pitch point, which is obtained from Table 18-15 by first computing the number of teeth of equivalent spur gear using Equation (18-6). 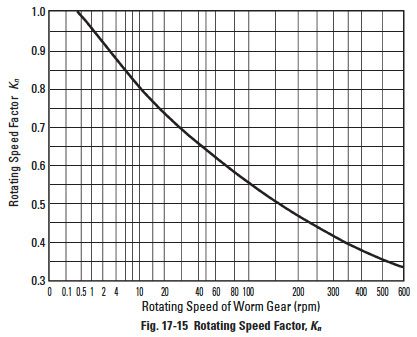 Generally, the worm is much stronger than the worm gear. Therefore, it is necessary to calculate the strength of only the worm gear. The allowable tangential force F (kgf) at the pitch circle of the worm gear is obtained from Equation (18-8). y = Form factor at pitch point, which is obtained from Table 18-15 by first computing the number of teeth of equivalent spur gear using Equation (18-9). Worm meshes have relatively high sliding velocities, which induces a high temperature rise. This causes a sharp decrease in strength and abnormal friction wear. This is particularly true of an all plastic mesh. Therefore, sliding speeds must be contained within recommendations of Table 18-20. Lubrication of plastic worms is vital, particularly under high load and continuous operation. Fastening of a plastic gear to the shaft is often done by means of a key and keyway. 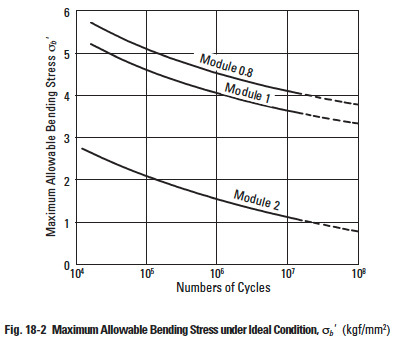 Then, the critical thing is the stress level imposed upon the keyway sides. This is calculated by Equation (18-10). 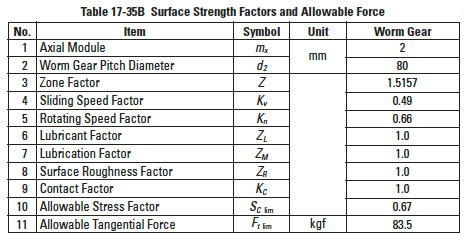 The maximum allowable surface pressure for MC901 is 200 kgf/cm², and this must not be exceeded. Also, the keyway's corner must have a suitable radius to avoid stress concentration. The distance from the root of the gear to the bottom of the keyway should be at least twice the tooth whole depth, h.
When above conditions prevail, it is expedient to use a metallic hub in the gear. Then, a keyway may be cut in the metal hub. - Press the metallic hub into the plastic gear, ensuring fastening with a knurl or screw. - Screw fasten metal discs on each side of the plastic gear. - Thermofuse the metal hub to the gear. The nature of the part and the molding operation have a significant effect on the molded gear. From the design point of view, the most important effect is the shrinkage of the gear relative to the size of the mold cavity. Gear shrinkage depends upon mold proportions, gear geometry, material, ambient temperature and time. Shrinkage is usually expressed in millimeters per millimeter. For example, if a plastic gear with a shrinkage rate of 0.022 mm/mm has a pitch diameter of 50 mm while in the mold, the pitch diameter after molding will be reduced by (50)(0.022) or 1.1 mm, and becomes 48.9 mm after it leaves the mold. 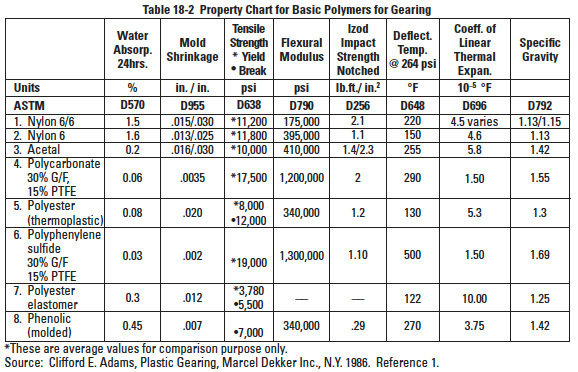 Depending upon the material and the molding process, shrinkage rates ranging from about 0.001 mm/mm to 0.030 mm/mm occur in plastic gears (see Table 18-1 and Figure 18-7). Sometimes shrinkage rates are expressed as a percentage. For example, a shrinkage rate of 0.0025 mm/mm can be stated as a 0.25% shrinkage rate. 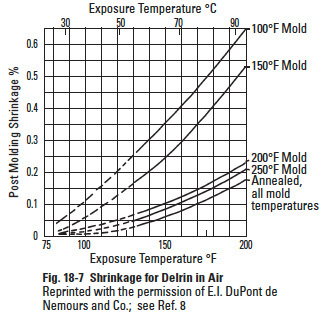 The effect of shrinkage must be anticipated in the design of the mold and requires expert knowledge. Accurate and specific treatment of this phenomenon is a result of years of experience in building molds for gears; hence, details go beyond the scope of this presentation. Mold cure time and mold temperature. Configuration of part (presence of web, insert, spokes, ribs, etc.). Location, number and size of gates. Treatment of part after molding. From the above, it becomes obvious that with the same mold – by changing molding parameters – parts of different sizes can be produced. 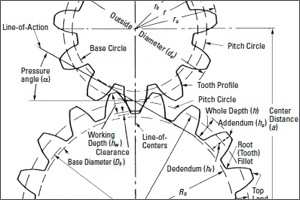 The form of the gear tooth itself changes as a result of shrinkage, irrespective of it shrinking away from the mold, as shown in Figure 18-8. The resulting gear will be too thin at the top and too thick at the base. The pressure angle will have increased, resulting in the possibility of binding, as well as greater wear. It follows that a hob generating the electrode for a cavity which will produce a post shrinkage standard gear would need to be of a nonstandard configuration. Let us assume that an electrode is cut for a 20° pressure angle, module 1, 64 tooth gear which will be made of acetal (s * = 0.022) and will have 64 mm pitch diameter after molding. For the sake of simplicity, we are ignoring the correction which has to be made to compensate for the electrode gap which results in the cavity being larger than the electrode. The shrinking process can give rise to residual stresses within the gear, especially if it has sections of different thicknesses. For this reason, a hubless gear is less likely to be warped than a gear with a hub. If maximum dimensional stability is essential. If the stresses in the gear would otherwise exceed the design limit. If close tolerances and high-temperature operation makes annealing necessary. 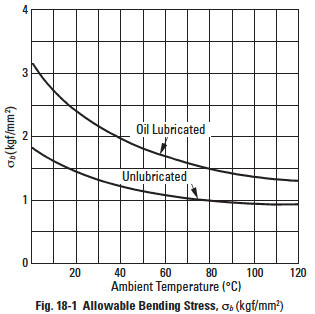 Annealing adds a small amount of lubricant within the gear surface region. If the prior gear lubrication is marginal, this can be helpful. Due to the thermal expansion of plastic gears, which is significantly greater than that of metal gears, and the effects of tolerances, one should make sure that meshing gears do not bind in the course of service. Several means are available for introducing backlash into the system. Perhaps the simplest is to enlarge center distance. Care must be taken, however, to ensure that the contact ratio remains adequate. It is possible also to thin out the tooth profile during manufacturing, but this adds to the manufacturing cost and requires careful consideration of the tooth geometry. To some extent, the flexibility of the bearings and clearances can compensate for thermal expansion. If a small change in center distance is necessary and feasible, it probably represents the best and least expensive compromise. In any discussion of tolerances for plastic gears, it is necessary to distinguish between manufacturing tolerances and dimensional changes due to environmental conditions. As far as manufacturing is concerned, plastic gears can be made to high accuracy, if desired. For injection molded gears, Total Composite Error can readily be held within a range of roughly 0.075 – 0.125 mm, with a corresponding Tooth-to-Tooth Composite Error of about 0.025 – 0.050 mm. Higher accuracies can be obtained if the more expensive filled materials, mold design, tooling and quality control are used. In addition to thermal expansion changes, there are permanent dimensional changes as the result of moisture absorption. Also, there are dimensional changes due to compliance under load. 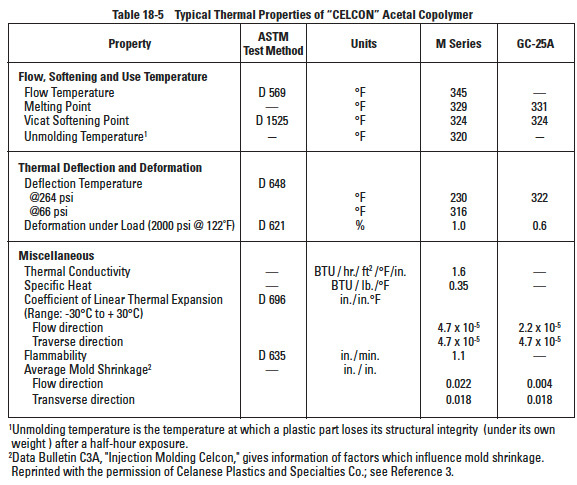 The coefficient of thermal expansion of plastics is on the order of four to ten times those of metals (see Tables 18-3 and 18-10). In addition, most plastics are hygroscopic (i.e., absorb moisture) and dimensional changes on the order of 0.1% or more can develop in the course of time, if the humidity is sufficient. As a result, one should attempt to make sure that a tolerance which is specified is not smaller than the inevitable dimensional changes which arise as a result of environmental conditions. At the same time, the greater compliance of plastic gears, as compared to metal gears, suggests that the necessity for close tolerances need not always be as high as those required for metal gears. In order to minimize stress concentration and maximize the life of a plastic gear, the root fillet radius should be as large as possible, consistent with conjugate gear action. Sudden changes in cross section and sharp corners should be avoided, especially in view of the possibility of additional residual stresses which may have occurred in the course of the molding operation. To avoid an extra finishing operation. To achieve greater dimensional stability, because the metal will shrink less and is not sensitive to moisture; it is, also, a better heat sink. To provide greater load-carrying capacity. To permit repeated assembly and disassembly. To provide a more precise bore to shaft fit. Inserts can be molded into the part or subsequently assembled. In the case of subsequent insertion of inserts, stress concentrations may be present which may lead to cracking of the parts. The interference limits for press fits must be obeyed depending on the material used; also, proper minimum wall thicknesses around the inserts must be left. The insertion of inserts may be accomplished by ultrasonically driving in the insert. In this case, the material actually melts into the knurling at the insert periphery.